Hands on learning makes new ideas fun. 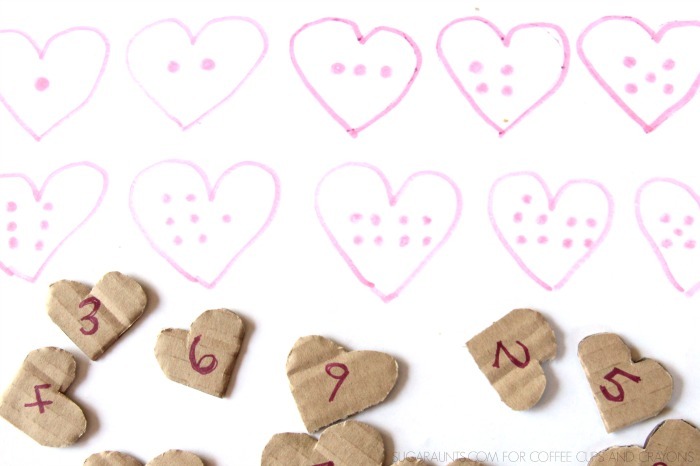 This Heart Number Matching Activity is a creative way to introduce counting and number identification to preschool children, all with a Valentine’s Day theme! We came up with this idea one cold day when we needed an indoor activity. It’s a quick math activity you can throw together and uses materials you probably already have in your home. Learning to identify the number of dots on a die is an important early math concept that is needed for so many later addition and subtraction tasks. When you add movable parts like our number hearts, you get a motor involvement in the learning task. 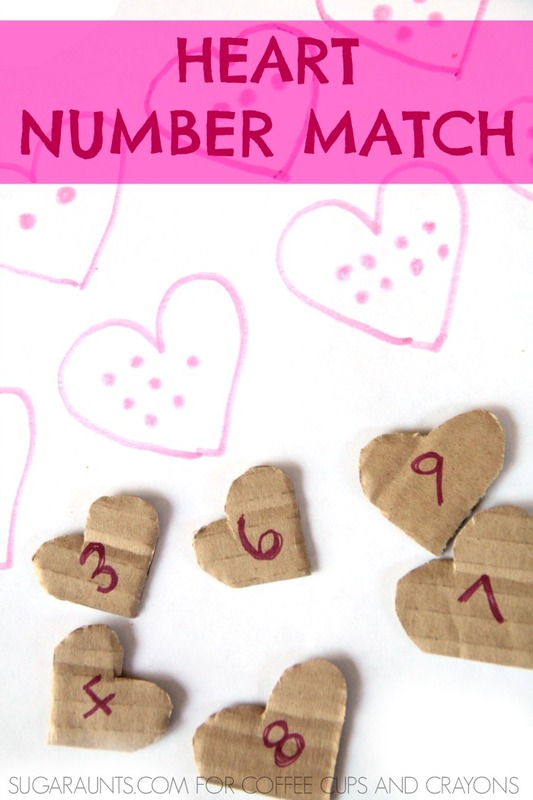 My kids love when we do math games, so this heart number match was just the thing to keep them interested and learning! 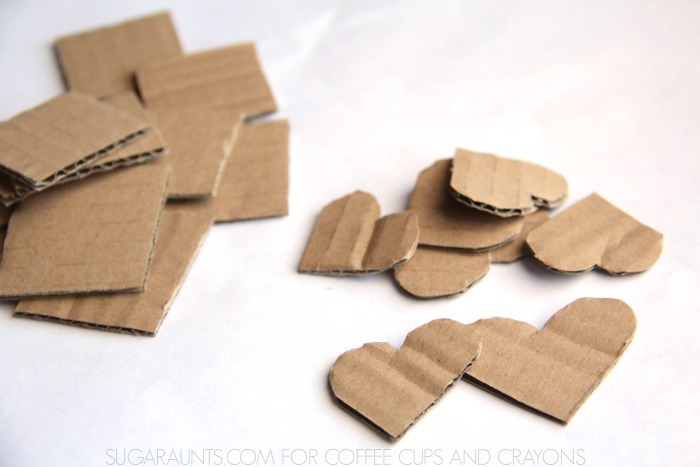 Make your cardboard hearts by cutting squares of cardboard. I used sharp scissors to cut the cardboard, so this is a job for an adult. Here’s a tip for cutting the squares into hearts. Use one corner of the cardboard square as the point of the heart shape. Then, cut two curves that meet in the middle of the cardboard square. This method makes cutting the cardboard into heart shapes much easier. Our hearts ended up being about 1 and a half inches wide. You can make your hearts as big or as small as you like. A larger sized heart would make a great gross motor math game for kids. Next, create a page of hearts with dots. We traced one of the hearts onto paper in several rows across the page. Use a marker to create dots in each heart. I made ours in numerical order, but you could add yours in random order, if you like. You can then write numbers on the cardboard hearts. Scatter the hearts around the table and show your child how to count the number of dots in the first heart. They will then need to visually scan the table to find the cardboard heart with the matching number. Visual scanning is an important skill needed for so many tasks, including handwriting and reading. Ask your child to first select a numbered heart. Then, they need to match it onto the heart on the paper. Ask your child to select two hearts on the table. Have them add or subtract the hearts and then draw a heart with the correct number of dots. Have preschool aged children line up the cardboard hearts in number order across the table. Use the hearts to play a gross motor scavenger hunt game, similar to this one. Have fun learning and playing with hearts! 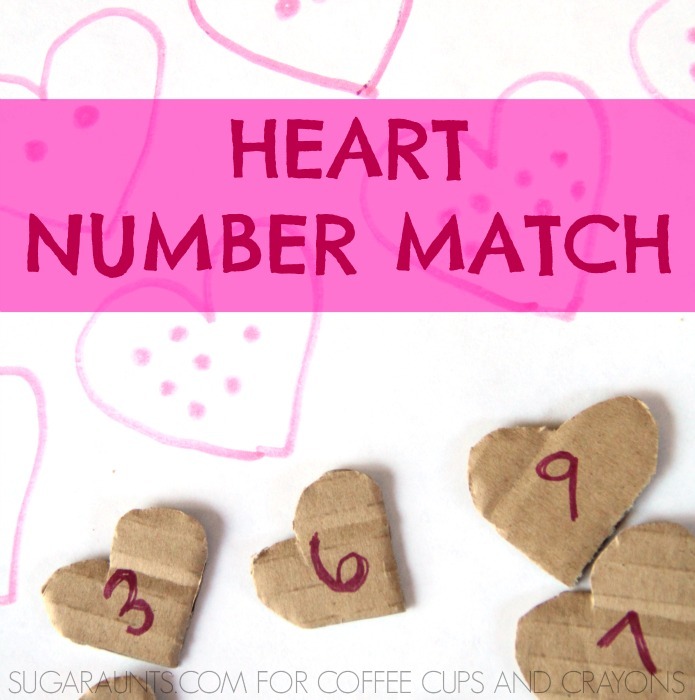 Let us know if you play this heart number matching activity.